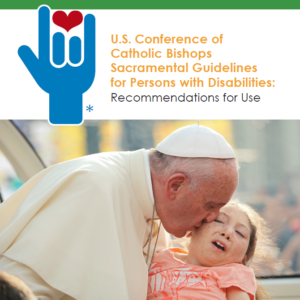 For USCCB Guidelines booklet, click here. Church teachings and values proclaim that every human life is a precious gift of a loving God, requiring respect and reverence for every person. 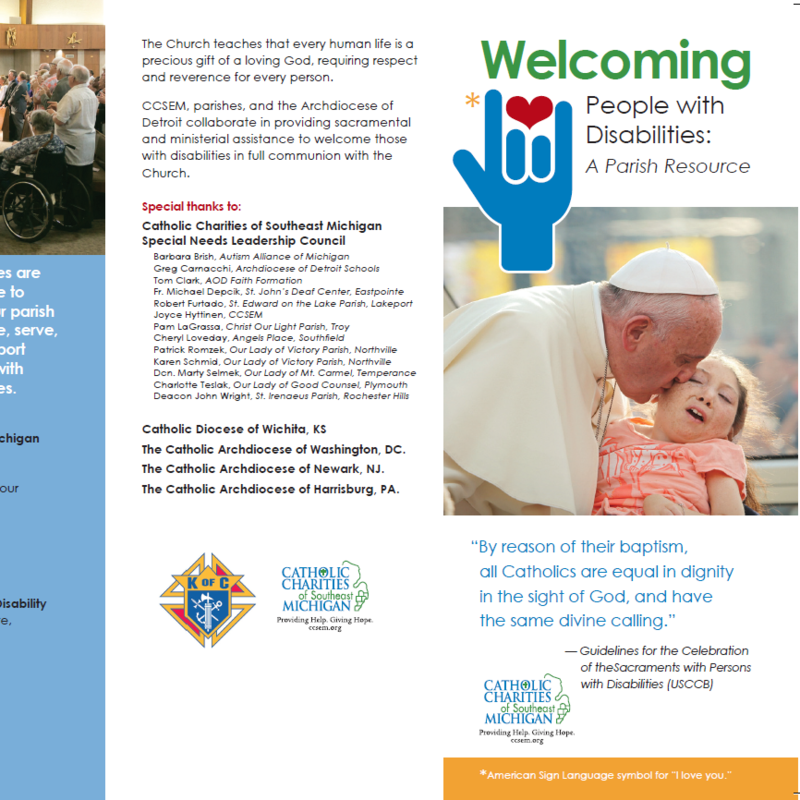 CCSEM, parishes, and the Archdiocese of Detroit, collaborate in providing sacramental and ministerial assistance to welcome those with disabilities in full communion with the Church. 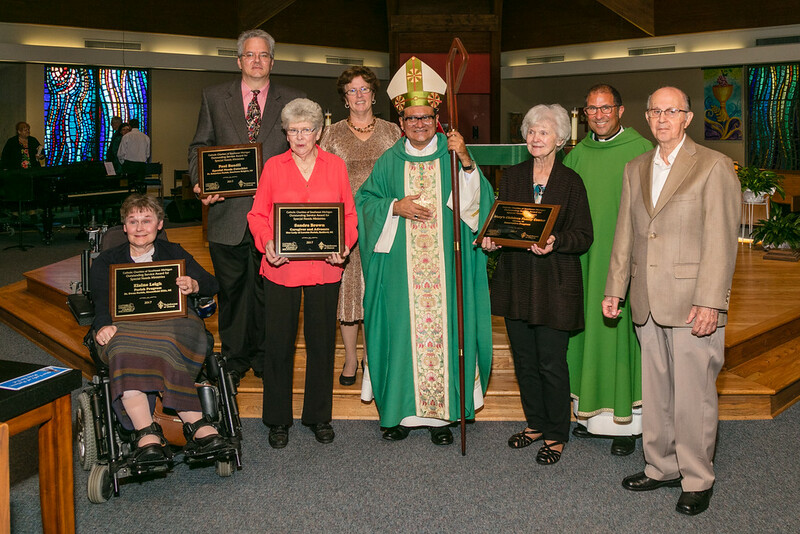 (From Left to Right) Elaine Leigh, Paul Bandli, Sandra Brown, Joyce Hyttinen (CCSEM), Archbishop Arturo Cepada, Marilyn Joseph, Fr. Steven Wertanen, and Richard Joseph. Elaine Leigh was recognized in Parish Program category. 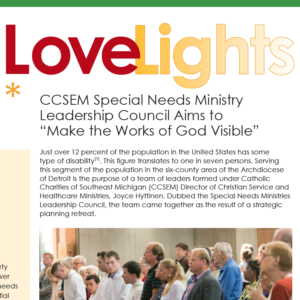 A parishioner at St. Owen in Bloomfield Hills, she has been a catechist for the past 35 years. She continued to serve even after developing multiple sclerosis and being confined to a wheelchair. Sandra Brown was recognized in the Caregiver and Advocate category. A parishioner at Our Lady of Loretto in Redford, she cares for her three sons, all with special needs. Paul Bandli, on staff at St. Sebastian, Dearborn Heights, was recognized in the Religious Education category. He is deaf, and is a catechist for two hearing impaired children. He also helps with the RCIA children’s catechumenate, and along with his wife Barb, heads up the vacation Bible School Kitchen. Mary’s Children Family Center was recognized as the most Innovative Program for Those with Special Needs. The award was accepted by co-founder Marilyn Joseph. The center provides a structured program for adults with brain injuries.